Morgan really got the ball rolling on abbreviations used in IHB Beer Slang, but here are some more specific terms and sayings that can strike love, fear, and humor into us in the IHB production circle. BSG (Brewer’s Supply Group) would send us a special candy bar hidden in a pallet of malt bags. It’s become industry lore nation wide to see a fabled nut roll show up on the grain delivery, hard earned by the folks downstacking the pallets of 55 pound bags of grains one by one. We don’t see those in our pallets anymore, but I have heard rumors of an IPA jerky now getting sent. Cross your fingers! In the meantime, I’m just going to occasionally buy a box of nut rolls for the team on Amazon. Armed with tri clamps and sani, our cellar and brewing team can hook anything to everything, in a secure* fashion. 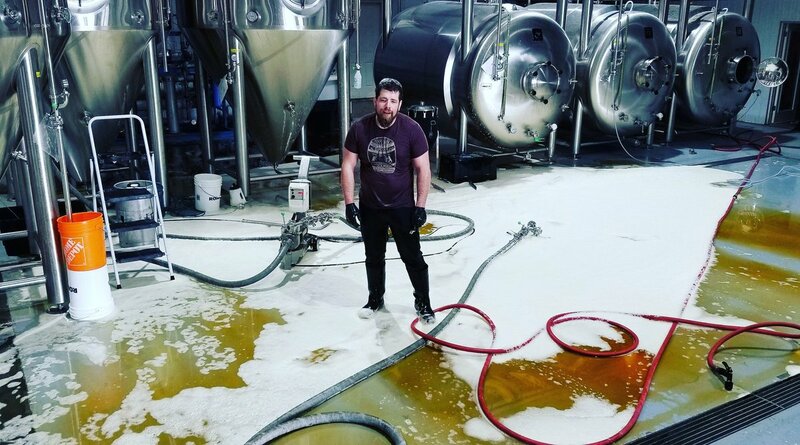 The image is not our brewery, but yes it’s definitely happened here and all internet hugs to that poor guy. Currently I’d say it’s our packaging team who uses the squeegee the most now that most of our floors are well sloped compared to the old facility. It is an oft overlooked art of removing water from flat surfaces in an efficient manner. Though you often feel like you are fighting a never ending tide. Something we don’t have to worry so much about now that we have our HopGun, but something very real and potentially very dangerous can happen at your brewery when you are “dry hopping” your beer (aka putting hops into fermenting or fermented beer strictly for flavor and aroma and not bitterness). Basically the same thing as mentos in pepsi occurs, millions of nucleation points in the hop pellets gather the carbon dioxide bubbles and they leave the solution. A smelly, messy, eco friendly collection of spent yeast and trub collected into two plastic tanks out back, picked up and used by the very rad folks at Natural Selection Farms. In the production circle, two of the nicest people I know like to flip each other off instead of saying hello, goodbye, I agree, 10-4, and/or great job. It is magical. In production, we have really worked hard to implement the idea of self management under the structure of Holacracy. For those who aren’t familiar, it structures communication and decision making in a way to remove emotions and improve transparency in the company. When you start a meeting, it begins with a check-in round, where each person gets to state where they are at time wise, or emotion wise, or whatever, without having to hear discussion about it from anyone else in the circle. Often, there will be a joke about eating too many hot peppers giving upset tummies, lethargy induced by kids at home being sick, or a complaint from me about bad cramps. We can all be honest, open, and go into the meeting with a clear understanding of each other’s mental status, and be better with our communication because of it. The most wonderful time of the year if you live within 100 miles of the Yakima Valley. On par with Christmas, St. Paddy’s Day, opening day of baseball, and/or Game of Thrones premieres. A communication tool we use often on our phones and computers for basically everything that email can do, but faster and with good emojis. A whatsapp type tool for business. No, not when beer with isomerized alpha acids gets exposed to UV rays, creating an aroma much like that of a skunk. I’m talking Cribbage! Any given time you are at the pub, there’s a chance someone from production is there having a quick pint. If there’s more than one person, I’m willing to wager it is Jake and Morgan, playing cribbage. Hope this helps paint a clearer picture the next time you hang out with a production cousin at the pub and hear us gossiping about the various aspects of the beer making life. Cheers!